We’d love your help. Let us know what’s wrong with this preview of Encore Provence by Peter Mayle. A whole new feast of adventures, discoveries, hilarities, and culinary treats, liberally seasoned with a joyous mix of Gallic characters. 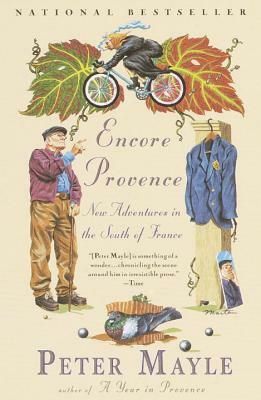 After trying--what folly!--to live in other places, Peter Mayle is back in his beloved Provence. He celebrates his homecoming by sharing with us a whole new feast of adventures, discoveries, hilarities, and culinary treats, liberally seas A whole new feast of adventures, discoveries, hilarities, and culinary treats, liberally seasoned with a joyous mix of Gallic characters. After trying--what folly!--to live in other places, Peter Mayle is back in his beloved Provence. He celebrates his homecoming by sharing with us a whole new feast of adventures, discoveries, hilarities, and culinary treats, liberally seasoned with a joyous mix of Gallic characters. The pauses for refreshment include an unforgettable meal in a converted gas station, a rendezvous with the very best bouillabaisse, and visits to eventful weekly markets. But there is life after lunch, and we also discover a school for noses in Haute Provence, a gardener who grows black tomatoes, the secret of the oversexed butcher, a celebration of Alowine (Halloween) Provence-style, and the genetic effects of two thousand years of fois gras. There is a memorable tour of Marseille, a comprehensive lesson on olive oil, a search for the perfect cork-screw, and invaluable recommendations for splendid local cheeses, wines, honey, bread, country restaurants, and off-the-beaten-track places to stay. To ask other readers questions about Encore Provence, please sign up. "Ceea ce face ca viața de scriitor să fie demnă de trăit este satisfacția de a descoperi că ai reușit să oferi câteva ore agreabile unor oameni pe care nu-i cunoști." This reads more like a Provence guidebook and less like a memoir. It has nice weight and heft after the insubstantial stories in Toujours Provence and has the same charming competent humorous writing style as A Year in Provence. I liked this book because I can see his journalistic tendencies more clearly. I enjoy the way he chases down a story and the lengths to which he’ll go to follow up on interesting possibilities like the perfumery school for blind children, the processing of olive oil and This reads more like a Provence guidebook and less like a memoir. It has nice weight and heft after the insubstantial stories in Toujours Provence and has the same charming competent humorous writing style as A Year in Provence. I liked this book because I can see his journalistic tendencies more clearly. I enjoy the way he chases down a story and the lengths to which he’ll go to follow up on interesting possibilities like the perfumery school for blind children, the processing of olive oil and the perfect corkscrew. I maintain that I’d like to know him and hang out with him in Provence – as it seems many other readers have wanted over the years – and even more than that, I’d love a life like his. O carte dezamăgitoare! Mult mai slabă decât "Un an în Provence". Written eleven years after A Year in Provence, Encore Provence continues Peter Mayle’s fascination with this delightfully sunny corner of France. In this book, Mayle (who, if you’re unfamiliar with his Provence books, moved along with his wife from England to Provence after chucking up a career in advertising) discusses—with his inimitable sense of humour and his obvious affection for Provence and its people—all things Provence, from the people to the laws, the land and its produce, the fabulous Written eleven years after A Year in Provence, Encore Provence continues Peter Mayle’s fascination with this delightfully sunny corner of France. In this book, Mayle (who, if you’re unfamiliar with his Provence books, moved along with his wife from England to Provence after chucking up a career in advertising) discusses—with his inimitable sense of humour and his obvious affection for Provence and its people—all things Provence, from the people to the laws, the land and its produce, the fabulous food. The wine. The perfumes. The lavender, the knives. There’s a chapter on the longevity of the average native of Provence, and how (possibly? Mayle never does find out) foie gras might contribute. There are Mayle’s observations on what comprises the ‘ideal’ Provençale village. There are fascinating, personal, and informative chapters on the selling and buying of truffles; on olives and olive oil; on the making and mixing of perfumes (not to mention what goes into developing a perfumer’s nose, and a description of a day spent at an amazing ‘school’ where blind teenagers are taught to smell). From kitchen gardens to handy (and restrained) lists of some of the best food markets, restaurants, and vineyards in Provence—Mayle covers it all. And how. A meal at the L’Auberge de La Môle is so lovingly described, just reading it made my mouth water. There are descriptions, fleeting and occasional, of truffle omelettes, of bread dipped in fragrant olive oil, of bouillabaisse made the Marseille way. Коли ти не їдеш в Прованс (хоча й дуже цього хочеш), Прованс приходить до тебе. І то так відчутно, що майже вдихаєш запах лаванди, чуєш, як під подувом містралю шелестить листя на столітніх оливах, слухаєш скрип старих віконниць, відчуваєш смак доброго вина... Здавалося, читати "Ще один рік в Провансі", не прочитавши першої частини - дурна ідея. Ба ні, книга цілком самодостатня. І зачаровує з перших сторінок. Це не путівник, хоча в ньому й можна знайти назви ресторанів із запаморочливою кухнею, Коли ти не їдеш в Прованс (хоча й дуже цього хочеш), Прованс приходить до тебе. І то так відчутно, що майже вдихаєш запах лаванди, чуєш, як під подувом містралю шелестить листя на столітніх оливах, слухаєш скрип старих віконниць, відчуваєш смак доброго вина... Здавалося, читати "Ще один рік в Провансі", не прочитавши першої частини - дурна ідея. Ба ні, книга цілком самодостатня. І зачаровує з перших сторінок. Це не путівник, хоча в ньому й можна знайти назви ресторанів із запаморочливою кухнею, імена кращих виноробів, сироварів, пекарів, торговців медом і трюфелями, адреси і графік роботи ринків, прізвища господарів найгостинніших апартементів. Але це схоже не на рекламу чи довідку, а на явки-паролі "для своїх". Неймовірно атмосферна книга! На її сторінках оживають колоритні персонажі французьких містечок - такі, що хоч зараз бери і пиши "під них" роман. Тут анекдотичні історійки перемежовуються з розповідями про особливості різних аспектів життя у Провансі. Від Пітера Мейла ви можете вивчити фірмовий жест провансальців і дізнатися, де роблять найкращі ножі й ідеальні штопори. Ви відвідаєте найцікавіші локації - скажімо, парфюмерну школу для сліпих підлітків і садибу братів-антикварів, які рятують (і продають) найкрандіозніші артефакти минулого- цілі каміни, сходи, велетенські статуї і фрагменти будинків. Oh my, give me another book by Peter Mayle please. This is a revisit to a lovely place that the author loved. Provence - truffles, vineyards, olives. Virtually meeting those lovely people who love wine, gardening and food. A place where peace and quiet still reigns. Enjoyable, Mayle in good form. Having read his previous books some years ago it's nice to revisit the dusty roads of Provence and rekindle dormant daydreams. Given that encore means "again" and toujours means "forever" I understandably mistook this book to be the second in the series, rather than the third, and so I read them out of order. I think no one will be terribly surprised that this is a watered-down version of A Year in Provence. It is less a memoir and more a collection of essays. I was hoping for more sketches of village characters and anecdotes about gardening, food, and local color. There are some of those, but mostly this reads like a t Given that encore means "again" and toujours means "forever" I understandably mistook this book to be the second in the series, rather than the third, and so I read them out of order. I think no one will be terribly surprised that this is a watered-down version of A Year in Provence. It is less a memoir and more a collection of essays. I was hoping for more sketches of village characters and anecdotes about gardening, food, and local color. There are some of those, but mostly this reads like a travel magazine assignment or a series of blog posts. I was put off by an oddly sexist outburst in the middle of an otherwise inoffensive chapter on corkscrews and knives in which Mayle starts effectively thinking out loud on the page about whatever in the world a laaaaaady need with a knife? What would she do with an accessory knife? Emergency manicures? Opening love letters? Puncturing a gentleman's reputation? (I could almost hear him saying, in a sort of Cary Grant voice, while typing, "A lady with a knife? Pfft! Preposterous!" Of course, in this fantasy a female costar -- preferably playing the role of his editor -- smacks him up the backside of the head.) For the record, Mr. Mayle, women use knives for the same things men do, which in this day and age is restricted mainly to opening packages. I was lucky enough to read the third installment of Peter Mayle's Provence trilogy in Provence itself recently. Not exactly in The Luberon though, we were staying in the slighty busier, more touristy part of Frejus but I'm not complaining, it's a beautiful place. As with the first two books it's like curling up with an old friend, an old witty francophile friend that causes you to laugh out loud (very possibly startling nearby sun-worshippers)and teaches you something new each time you engage wit I was lucky enough to read the third installment of Peter Mayle's Provence trilogy in Provence itself recently. Not exactly in The Luberon though, we were staying in the slighty busier, more touristy part of Frejus but I'm not complaining, it's a beautiful place. As with the first two books it's like curling up with an old friend, an old witty francophile friend that causes you to laugh out loud (very possibly startling nearby sun-worshippers)and teaches you something new each time you engage with it/him/her. As far as I know this is the last one but I also know if another does come out I'll definitely be reading it. Equally I'll definitely be going back to Provence. Where felt like a Dear Diary and I loved it, Encore Provence feels more like a How To and I only liked it. Encore Provence really gets more specific, and detailed, and Provence loses a lot of its magic fairyland feel, becoming more of a Real Place. A Real Place I want to visit, no doubt, but not asap. I almost wonder if Mayle did this deliberately, to discourage people like me from visiting, and messing up his magic fairyland! If so, touche. Харесвам Питър Мейл и третата част от поредицата му за Прованс ми допадна. Книгата е по-скоро пътепис, а не роман. Сборник от истории, написан с приятно чувство за хумор, усет към детайла, любов към храната и природата. Книга, която носи сетивна наслада и удоволствие. Just as entertaining as his other Provence books. Love all the Peter books! Another book of essays about living in Provence by Peter Mayle. Easy to read, easy to put down. Some of the essays are really interesting, like the one about truffle growers and poachers and buyers. Some are less so, like the one about corkscrews. I loved Mayle's first book, but this one kind of felt like he'd kept writing about Provence in order to make a living, which I completely understand, but I'd love for him to write another cohesive story rather than these collections. As always, this book Another book of essays about living in Provence by Peter Mayle. Easy to read, easy to put down. Because living in the south of France, or Normandy, or Italy, sounds so wonderfully exotic and impossible, reading about those who have chosen to do is both wonderful and a cause for jealousy. I read A Year in Provence and Toujours Provence many years ago, and happily both continue to reside on my shelves. I borrowed Encore Provence from my workplace for some Christmas/New Year relaxation. Written a decade after the first two volumes, the elapsed time included relocation to California. This volu Because living in the south of France, or Normandy, or Italy, sounds so wonderfully exotic and impossible, reading about those who have chosen to do is both wonderful and a cause for jealousy. I read A Year in Provence and Toujours Provence many years ago, and happily both continue to reside on my shelves. I borrowed Encore Provence from my workplace for some Christmas/New Year relaxation. Written a decade after the first two volumes, the elapsed time included relocation to California. This volume touches on his responses to returning to his beloved Provence. His writing has improved from his first volumes (not that it was ever poor), but I was less enthralled. Perhaps it was because A Year in Provence was my first written encounter with this region, and the first cut is indeed often the deepest. It may also be that this was less of a chronicle and more of a travelogue. The first volume had a wonderful narrative structure that held the work together. There was finding a house, transforming it, adjusting to the community. In short, it chronicled the making of a home. Nevertheless I enjoyed this immensely. There are wonderful explorations of the truffle trade, village life, food and life. One piece (Restaurant Critic Makes Astonishing Discovery), a response to an American food critic’s disappointment with Provence is perhaps overly defensive, but on the whole each piece is delightfully bucolic. Many are also thought-provoking. Many of us in the Anglo-Saxon world know that we are too busy, and that there are more important things than work and accumulation. Still, most of us (myself included) seem unable to do anything about it. Writers like Mayle in a sense are important because they make us pause and think before we keep along our path, and because they are entertaining and not didactic, some of us at least take heed. His reflections on a transplanted London advertising executive turned Luberon wine-maker and the benefit of agricultural work makes even this brown-thumb want to take up food-growing. Not that life in Provence is perfect. Buying a car can be a bureaucratic nightmare, and getting a tradesperson on site can be almost impossible. And the French as a whole are an enigma. How is it that a people whose diet consists of lovely fatty foods have the lowest rate of cardio-vascular disease in the western world? Some of the reason of course is portion size, and not every meal is foie gras and camembert. Perhaps it is also because, as a whole, the French (like the Italians) have discovered (or have never forgotten) that time spent over good food with good company, washed down with good wine is not one of the finer things in life. It is the finest thing in life. Peter Mayle’s “Encore Provence” …the third novel in his Provence series. His books are always great fun; reading them is like going on vacation. In this installment of the series, Mayle (an Englishman by birth) writes about returning to Provence after a four year absence, when he and wife moved back to England. The novel - so vivid and rich in its explanation of the smallest detail of life in Provence - makes one yearn to be transplanted to that picturesque landscape. The charac You’ve got Mayle! The characters are true to life and wonderfully portrayed. As I made my way through its pages, Mayle’s cheeky humour (almost sarcastic at times) had me giggling surreptitiously on the bus this morning. What better way to start off a Friday morning? More to follow…including rating and reaction to the book in entirety. This book has many charming moments but like Toujours Provence, it's not tightly bound around a timeline in A Year in Provence. The first book sounds more like "an adventure" to me with so many solid characters. I totally miss the glumy and earthy Faustin, the fabulous Monsieur Menicucci, the reclusive Massot, the amusing Benard...But they didn't make a comeback within these pages except for a mention of Faustin's father passing away of old age. The final book in the series written after being absent for a few years. Lovely fun read with lots of trivial but interesting info on Provence. I might have never known about the school for blind children started by L'Occitane or that the best corkscrews in the world are made by Langiuole the French knife makers, or that juniper wood is a natural moth and insect repellent. I am looking forward to moving on to his novels next. This isn't what I feel is Mayle's best in his examinations on Provence, but it's still one of the better ones. Much of what he talks about here is stuff he's covered before, though from a period of absence. Still, like in the others I like best, he follows where the whims take him as opposed to trying to make things fit too much of a structure. It works better for me and I think it suits the material more. I certainly enjoyed reading. I really liked the first two books. This one is so boring I could hardly get through it. Peter Mayle needs to find a new topic to write about because this one is tired. I think the difference is that in the first two books he wrote about things that happened to him, but in this book, he is doing research and trying to find stories and things to happen to him. This one is heading to the giveaway pile. A nice visit back to what we read in A Year in Province. Mayle still has a keen eye and sense of kind humor to the residents of Province and I find his writing interesting and honest. There will be some call backs to the first book in this series, but it reads much better than the second book, Toujours Provence. If you enjoyed A Year in Province, I would recommend skipping Toujours and going straight to this one. Peter Mayle delivers again. I just read this on my South of France vacation and enjoyed it immensely. I'd already read "A Year in Provence" and "Toujours Provence" and I recommend reading those first. They are light reads, but highly entertaining, and Mayle has a knack for nailing the Provencial lifestyle. Numerous times as I was reading it, it seemed as though he were describing a situation I'd just encountered. Best read during or after a trip to Southern France. I thoroughly enjoyed Mayle's A Day in Provence and Toujours Provence which I read several years ago. Encore Provence was just as good. It's about Mayle's experiences living in Provence (he's an Englishman). This one was written 10 years after the second book. This was written 12 years ago, but I'm looking forward to seeing what he describes. He has a delightful way of explaining his life and escapades in Provence. It's like you're sitting with him as he discusses them. Entertaining. IF you are a travel buff and/or a gourmand (of the armchair type) than Encore Provence is for you. Peter Mayle has a gentle, friendly writing style, and a deep love and respect for his subject. I'm not a foodie; wine and truffles are not for me, but just reading about them make me feel well traveled and well fed. Couple this book with Frances Mayes' Under the Tuscan Sun (book AND movie) and travel to wonderful places, with no lines at the airport. “The French, it seems to me, strike a happy balance between intimacy and reserve. Some of this must be helped by the language, which lends itself to graceful expression even when dealing with fairly basic subjects.... And there's that famously elegant subtitle from a classic Western. COWBOY: "Gimme a shot of red-eye." SUBTITLE: "Un Dubonnet, s'il vous plait."